Connecting Gmail calendar to Outlook is a popular request and unfortunately, it's not possible unless you use an add-in. However, if you only need a read-only calendar, you can add a Gmail calendar as an Internet Calendar and view your appointments (but not edit or add new appointments). 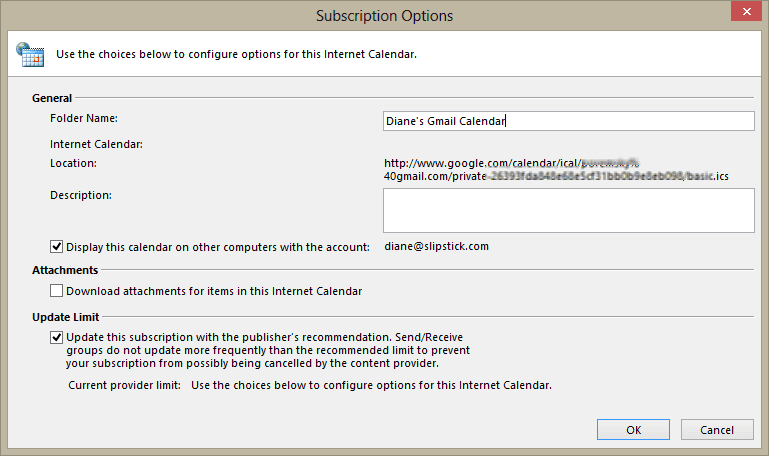 You need to use the Private ics link in Gmail and add it as an Internet Calendar in File, Account Settings, Internet Calendar. Another option, if you use Outlook.com, is to subscribe the calendar in Outlook.com. The shared calendar syncs with the Outlook.com account. It's still going to be read-only, but avoids the occasional send and receive errors a subscribed calendar generates. The Google Calendar Sync Utility utility will work with Outlook (all versions). Click the ICAL icon for the Private Address. If you choose the Public Address, you need to enable public access on the Share this calendar tab. Right-click on the URL and choose Copy. In Outlook, go to File, Account Settings, Internet Calendar tab. Paste the URL in the address field. It's no longer necessary to remove the S from the HTTPS URL, but if Outlook won't download or gives you an error, remove it. Click Add. Enter a friendly name for the calendar and return to Outlook. The calendar will sync to Outlook but it is read-only. You can't add appointments in Outlook and have them sync up to the server. Updates made to the calendar online should sync down to Outlook hourly. This video shows the steps to get the iCalendar ICS URL from Google Calendar as well as add it to Outlook. If I do this, can others see this calendar in Outlook? Will it be public in that it shows I'm busy but not what the actual event is? I use Google calendar but my company uses Outlook. I am trying to embed my Google calendar into the Outlook calendar without others being able to see the actual events on my Google calendar. subscribed calendars are private to you - only people looking at your desktop would have the opportunity to see it. 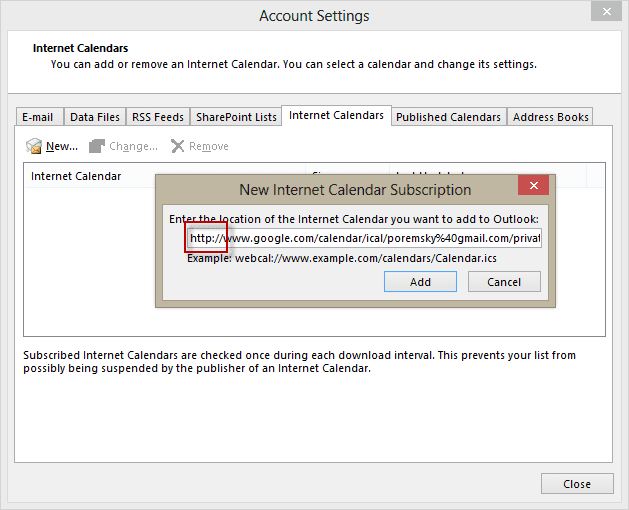 You couldn't share the calendar from outlook even if you wanted to - you'd need to give out the url. I've been dealing with this for years, where Outlook stops getting updates from my Google calendar. In the past it seems like it would stop updating about every 3 months, so I would delete the calendar in Outlook and re-add it. it would then immediately go get the "new" information in my Google calendar. But, lately it's stopped updating about every other week...which is extremely painful. I follow the steps above, no differently than I have for quite some time. Any ideas on what the problem might be? No idea, but it's always been a bit buggy. However... they are working on a solution that Syncs Gmail calendar and contacts to Outlook via the "Microsoft Cloud". It's in limited testing right now (a small # of Windows Insiders had the option enabled in an update to Windows 10) - not sure when it will be available to the general public. I wasn't offered this with my account so i have no idea how well it works yet. Any updates out Outlook integration with calendar/contacts for mac? It works beautifully on iOS, so I know many people would enjoy this feature. At this time, no, it's not supported in the desktop version, but they are working on a solution for Outlook desktop which should work in both windows and mac versions. I don't have an ETA though. Microsoft announced today this feature for Outlook 2016 for Mac (it's limited to a small number of Office Insiders). Hopefully the Windows version is not too far behind. Thank you very much for this information. I have successfully subscribed to my Google calendar in Outlook 2016 but any changes that I make in the Google calendar (new and deleted events) are not showing in Outlook. Any ideas? Do the changes ever sync? When it's added as a subscribed calendar, you should get updates about once an hour. Hi Diane, I don't know if Sarah's problem has been resolved, but I completed the steps above and am now having the same problem--entries that I edit or delete in my Google calendar (using my iPhone--not sure if that matters) are not syncing to my desktop Outlook. Any suggestions? Does it sync if you select the calendar and click the Update folder button? Subscribing to google calendars has been buggy and it would probably be better if you used a utility to do a 2 way sync. Linking my Gmail calendar, which is the one I use on phone/online etc, to my Outlook 365 has only left me with problems and grief - I certainly wish this would be an option Microsoft would embrace - Google calendar is widely used on mobile platforms, and should be hasslefree, fully 2-way functional in Outlook. Instead, the difficulty of setting up and syncing is painfull, and obviously designed to throw off any users from using this "option". They are working on a solution - i don't know the status of it yet but might find out next week when I'm in Seattle for meetings. Did you ever get any feedback on this?It's amazing that Windows 10's built in calendar app works both ways with Google, but Office 2016/365 doesn't..
they are working on a solution - not sure when they expect it have it available though. I'm assuming by next summer, but time will tell. The reason it's not built into outlook is that it's harder to add new features to outlook - they built the new mail client from the ground up, soi it was easier to build support into it. I tried it and I get this message: "Cannot verify or add the Internet Calendar in Outlook. Verify the link is a valid calendar link." Please help. Are you using the public or private link? 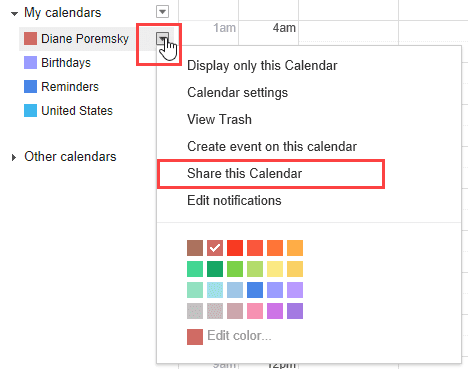 use the private link - if you use the public link, you need to enable problem access on the share this calendar tab. Diane, I actually just downloaded Google Apps Sync for Outlook and it synced right up without having to do all this and it allows you to manage and make changes. Yeah, addins are often easier and most should be two way, so you can add to the calendar too. But if this is the Google apps sync that google has out, it only works with paid accounts, not free gmail. Diane, everything from my google calendar is showing with details in my outlook but it is in read only mode. Is there a way to make changes and manage the calendar from Outlook? No, not for free gmail accounts. If you have a Google Apps (business) account, it is still supported.